As a South Asian in search of a Hindu Temple in Burlington, I am walking down the Allen Street, but I find no sign of any Temple being present there: no buildings made with pagoda-style architecture, no street vendors selling flowers, no people wearing Hindu objects of religious significance, no bhajans playing in the background, and no cows for the devotees to worship. As I further walk down, I pass concrete buildings and churches, and finally, I’m in the place where the map located the Hindu Temple, which was inside a school! Upon entering the temple inside the school, it was just like any other Hindu Temple as I could see idols and posters of Hindu Gods and Goddesses in the front of the room, with people sitting crossed-legged and devotionally participating in the ritual by singing bhajans. The community members were energetic and cooperative, which enhanced my experience of being in the space of the temple. 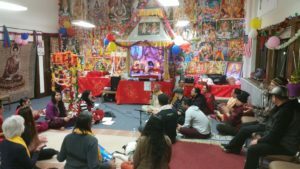 The Vermont Hindu Temple’s website mentions that it was “started by Bhutanese Nepali refugees to celebrate and share Hindu philosophy and practice. All are welcome,” and the latter part of this statement is evident by the degree of openness the community had when I interacted with them and got a warm welcome in return. The school space within Burlington both shapes and limits the extent of practicing the ritual in the temple. Established in 2015, the temple’s space is rented inside the premises of St. Joseph School, so they are still struggling to find a more permanent space to make the temple. In an interview with the priest of the Vermont Hindu Temple, Mr. Som Nath Dhakal says “we haven’t done indoor practices for just keeping sound under control but here we are not allowed to disturb the neighboring community that means we are just doing our program in a room-based only, and so to explore our culture and to go to the wider community, we need more space.” Despite the space limitation, the school space has been successful in shaping the extent of practicing the rituals as I ask the members of the community how far their home was, they said it is in a walking distance, so the current location of the community in the Old North End is near to an ideal location as members of the community live nearby. Now three years after its establishment, the community has been well-known to the wider Burlington community as being located in a convenient place and again, it was possible because the school is renowned in the area. A sense of mutualism exists in the space between the school and the temple because the temple can serve as a site to learn diverse cultures for the school children and the school premises provide security to the temple. However, just like in DeWitte’s “Encountering Religion through Accra’s Urban Soundscape,” tensions do arise when two religions have conflicting ideas in an urban space but in this case, it is between the school, and the temple in Burlington. At times when an event of the Hindu Temple is scheduled at a stringent time due to religious beliefs and if that time clashes with school hours, this limits the extent of freely practicing their ritual as the community members will need to reduce their volumes and this makes the community members conscious of themselves in practicing their ritual. Among several visits to the temple, three of my visits were on the major Hindu festivals, namely Rama Navami, Holi, and Shivaratri. In all my visits, the people present there were not only from the Bhutanese Nepali refugee community but people from non-refugee and non-Hindu American community were also participating there. Together as a strong community sharing and wanting to know more about Hindu traditions, I could see the members of Vermont Hindu Temple proactive in staying on top of all events, despite their busy work schedules. Being a community initially formed by new Americans, they have been successful in coping their fear with bringing practices that are different by making the wider Burlington community involved in its activities through social media. Also, while making an announcement to invite the members of the community for an event, they constantly acknowledge that they have “full support from the Burlington community and the Burlington Police,” so that all members feel safe while participating. This leads us to Robert Orsi’s idea of religious cartographies because while performing religious festivals openly in public, the places they feel secure or insecure can affect their extent of performing rituals freely in Burlington. Secure places for the members of the Hindu Temple develop as they perform in groups rather than performing alone, whether it is inside the temple or at Church Street while celebrating their festivals. Their extent of feeling secure would also differ depending on where they choose to celebrate because celebrating festivals at the premises of the University of Vermont(UVM) would not be the same as celebrating it the Old North End, and since the concentration of members of the community is high in the Old North End, they get more support and feel more secure in performing their ritual there. Not only this, the secular space within UVM creates tension for the members of the community as any sound they generate while performing might be categorized as mere “noise” and thus, religious cartographies do exist when considering how Burlington becomes a space for practicing Hinduism for the community members of the Vermont Hindu Temple. On March 3rd at 10:00 AM on a Saturday morning, I am walking down the icy sidewalk of the College Street to get to a Hindu festival known as Holi, which was happening on the Church Street. As I march down the road, I see some members of the community returning after celebrating the festival with full of colors all over their body and I could hardly recognize anyone’s face because it was covered with colors. Holi is the spring festival of colors and it is meant to be celebrated outdoors so, the community members chose a different place than their usual place by deciding to celebrate it in front of the crowd at the Church Street Marketplace. As I was approaching the place, I could hear the sounds getting louder of people greeting each other by saying “Happy Holi.” When I finally got there, I could see people joyously celebrating Holi, as well as I could see the outsiders watching them with great enthusiasm, cheering them and wanting to know more about what was happening. The festival was organized in a form of a parade, so I joined along with them and we marched around the City Hall and the entire Church Street. While marching, we threw colors at each other, sang songs, and played different musical instruments, and above all, enjoyed the moment of being present in a different space. A member of community while explaining the festival to an outsider says, “Holi is not just about throwing colors as you can see, but it holds a great religious significance like the victory of good over evil.” To an outsider not knowing the significance of this festival, it may seem as if people are being disruptive in the community by making noise and by polluting the streets with colors. In fact, this is not the case at all because their intention of celebrating the festival is not to disturb the community but to find a common ground in sharing love for the community in public. In his article “Noise. Church. Flesh.,” Crawley mentions the noise coming from a black flesh as “not everyone is pleased with noise, with the noise of flesh. Noise has the capacity to antagonize and exposes us to the vibration, the movement, the sound, that the Western theological and philosophical traditions seek to still.” The issue raised by Crawley that we tend to presume certain bodies as being noisy can be related to this scenario of celebrating the festival of Holi in public because as this festival continues gaining popularity in the US and as people who celebrate it are mostly from the Indian-subcontinent, the outsiders watching this festival might have a preformed notion regarding this festival as being loud however, looking at the people playing colors with joy, the outsiders might even associate the people as being friendly and humble. Therefore, people living near the surroundings of the temple believe to what extent “noisy” the members of the Hindu Temple are by just looking at them when festivals and gatherings happen outside the temple. Then there were days when I went to participate on a ritual happening inside the temple, and as I opened the door of the temple, I could see the members of the community sitting cross-legged, full of joy, facing the sacred images of Hindu Gods and Goddesses while singing, so I went on and did the same. Around the corner of the room were provisions made for the elderly and the disabled people to sit. Every ritual is started by burning oil lamps and incense sticks and with its soothing smell began the sequence of events for the ritual: taking turns to sing the bhajan, which means hymns; the closing aarti, which means praising the deity; and finally, the prasad, which means eating food served to the deity. While participating in the ritual, I could hear some keynote sounds like cars passing outside the window, and kids running outside the door however, these sounds were barely noticeable as it was only heard when consciously listened so, it did not affect the community in any way because the sounds made while performing the ritual were louder. Types of sound also included signals such as the mantras recited by the priest, the flow of musical songs, and the lyrics of the bhajans itself. These signals are listened to consciously and any change in these signals would alter the experience of the community such as when a priest completes singing bhajans, it makes people aware of the transition from one event of the ritual to another. Then there were the sound marks, which made the acoustic life of the Temple unique, and such sound marks included chanting of the sacred word Om, and the blowing of the Conch Shell. Nestled within these soundscapes, the space of Vermont Hindu Temple opens its arms to anyone wanting to be a part of it. “Practicing Hinduism here in the space of Burlington or in anywhere in the United States differs from what is authentic” said to me a member of the community when I curiously asked what was different as compared to back home. The practices that were authentic were removing shoes before entering the temple as a matter of purity, the priest leading the bhajans and offering objects of religious significance like tilaka, prasad, and kalava. Similarly, the hymns were sung in the same manner. However, some festivals like Holi that fell on a working day were celebrated in the weekends and in many Hindu traditions, as festivals should be strictly celebrated on the day it falls on the lunar calendar, the events of the Vermont Hindu Temple in this way might not be authentic to what people in the Indian subcontinent practice. Linking this to the idea presented by Robert Orsi in his “Introduction” to Gods of the City, religions do evolve over time due to ongoing exchanges among generations in an urban space, so he mentions that “urban religions have offered occasions for new possibilities of selfhood to be crafted, discovered, assayed, and represented and for contesting customary gender arrangements, racial understandings, ethnic affiliations, and cultural expectations.” Seeing this argument made by Robert Orsi in the context of Vermont Hindu Temple, new possibilities and understandings do occur in an Urban space but I would like to take his arguments even further by saying that even compromises among generations do exist because most Hindu Temples in the Indian subcontinent have signs on the temple doors saying “Hindus Only” as people eating beef are viewed as being disrespectful to the sacred cow and as a matter of purity, only Hindus are allowed but here in Burlington, we can see from the Vermont Hindu Temple’s website that “all are welcome” and with this brings a possibility of non-Hindus being part of the community, understanding among generations, and a compromise from what is authentic. Therefore, the relationships between religion, sound, and space are closely interconnected as we saw how the space within the school both limits as well as shapes the extent of practicing the ritual, how as new Americans were they able to cope their fear with bringing practices that were different, how religious cartographies form, how the non-members associate the members as being “noisy” based on their ethnicity, and how a religion transforms from the authentic in an urban space. These analytical concerns help us see the interconnectedness of religion, sound, and space in the Vermont Hindu Temple and finally, as an abstract of their interview, Steve Feld and Don Brenneis stress the importance of sound in a community by saying “social theorists, historians, literary researchers, folklorists, and scholars in science and technology studies and visual, performative, and cultural studies provide a range of substantively rich accounts and epistemologically provocative models for how researchers can take sound seriously,” so knowing the relationship between religion, sound, and space is crucial to understanding how a community works. Brenneis, Donald with Steve Feld. 2004. “Doing Anthropology in Sound .” American Ethnologist 31(4): 461-474. DeWitte, Marleen. 2016. “Encountering Religion through Accra’s Urban Soundscape.” pg. 133-148. Orsi, Robert. “Introduction ” to Gods of the City. pg. 56-60.